Living Dead World: More Current Events! 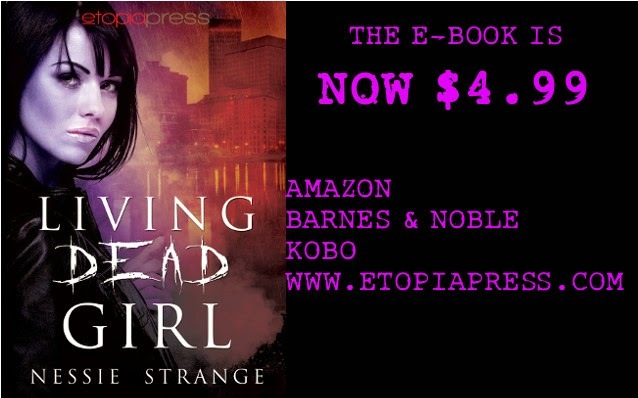 **Living Dead Girl is on sale. Or, the e-book version is. **There's also a signed paperback of Living Dead Girl up for grabs on Goodreads. There's a link in the sidebar! **Reaper Madness is now up on Goodreads. As of yet, I don't have a release date to share, but I will be posting more information as it becomes available. Jen MacLellan can’t get the hang of being a reaper. Her search for Jack, the man she loves, has come up empty. Now Death is breathing down her neck, dangling the promise he’ll remove that annoying telepathic link to the crass, sarcastic reaper named Sam if she gives him what he wants. But when reapers begin to disappear back on earth, leaving behind walking, talking dead people, Jen and Sam are thrust in the middle of a dangerous mission. Can they figure out what’s happening before it’s too late? Jack Norris can’t remember anything before waking up in the living room of the half-demon Nulcifer six months earlier, but every time he closes his eyes he has visions of a mysterious, beautiful brunette. As he investigates his origins, a string of tortured past lives and fragmented memories weave together to reveal an undeniable link to the woman he’s been dreaming about. The question is, does she exist? And if she does, how will he find her? Fate takes a drastic turn when Sam falls victim during a routine visit to earth, leaving Jen devastated and desperate to get him back. She seeks the help of a shady associate of Sam’s, only to run smack into the man she never thought she’d see again: Jack. The two embark on a journey to rescue Sam, but as they get reacquainted, dark secrets and plots are revealed, proving nothing is simple when it comes to love.